Our compère for the Deep Learning Stage today will be Anirudh Koul, Head of AI & Research at Aira. In order to build agents that can reason about the consequences of their actions and control the world, it is important to acquire rich priors that capture a notion of how to plan forward into the future. Imagining the consequences in raw pixels is unlikely to scale well for large environments and also has no incentive to ignore aspects of the raw sensory stream that are irrelevant to the task at hand. I will talk about ways to circumvent this issue by introducing explicit differentiable planning inside the policy's computation graph and show that the learned priors are generalizable across different robot morphologies and can capture a generic notion of the underlying task in its representation. Aravind is a second year Ph.D. student at UC Berkeley advised by Prof. Pieter Abbeel and is part of the Berkeley AI Research lab. He has spent time at OpenAI and is interested in learning representations from raw sensory data for general intelligence. Quantifying predictive uncertainty in deep learning is a challenging and yet unsolved problem. Predictive uncertainty estimates are important to know when to trust the model's predictions, especially in real-word applications, where the train and test distributions can be very different. Bayesian neural networks are currently the state-of-the-art for estimating predictive uncertainty; however these require significant modifications to the training procedure and can be computationally expensive. I'll talk about our recent work on "Probabilistic Deep Ensembles", an alternative to Bayesian neural networks, that is simple to implement, readily parallelizable, requires very little hyperparameter tuning, and yields high quality predictive uncertainty estimates. I'll discuss experiments that show that our method produces well-calibrated uncertainty estimates and is robust to dataset shift, and also highlight how we used this method in a challenging healthcare problem. Object detection is a core computer vision task, where a machine learning (ML) model is trained to identify objects from a pre-specified set of object categories. In a real-life scenario, e.g., when an object detector is used to process the picture taken by a mobile phone camera, not all object categories are known to the ML model in advance since new objects of interest appear constantly in a user environment. As a result, it is important for object detection models to be continually learning -- they need to learn how to recognize new objects without suffering from the phenomenon of catastrophic forgetting, where the ML model forgets about old objects while learning about new ones. In this work, we discuss a new technology we have developed that can effectively do incremental learning for object detection in near-real time. We discuss the underlying mathematical framework of a novel loss function that enabled us to achieve state-of-the-art performance on benchmark datasets. We will also outline our efficient training and inference framework, which enabled our prototype system to successfully recognize objects in a real-world live demo scenario. We also discuss extensions of our incremental object detection work, where we can use auxiliary unlabeled data to get better models or use AutoML methods to automatically learn the best neural network architecture in the continuous learning mode. We next give a brief overview of a novel recurrent neural network model with attention that we have developed for the task of Visual Dialogue, where the user initiates a dialogue with the system regarding a picture. We conclude by discussing how incremental object detection, improved visual dialogue, and other novel research contributions form the cornerstones of a new framework of Conversational Vision, which is an active computer vision technology at the intersection of Natural Language Processing, Dialogue Understanding and Computer Vision. Most progress in machine learning has been measured according to gains in test-set accuracy on tasks like image recognition. However, test-set accuracy appears to be poorly correlated with other design objectives such as interpretability, robustness to adversarial attacks or training compact networks that can be used in resource constrained environments. This talk will ask whether it is possible to have it all, and more importantly how do we measure progress when we want to train model functions that fulfill multiple criteria. We present an algorithm for video coding, learned end-to-end for the low-latency mode. In this setting, our approach outperforms all standard video codecs across nearly the entire bitrate range. To our knowledge, this is the first ML-based method to do so. We propose a novel architecture for video compression which generalizes motion estimation to perform any learned compensation beyond simpler translations. Our architecture allows for joint compression of motion and residual and can dynamically trade-off between them. It is also able to model multiple flow fields in the same frame. We propose an ML-based spatial rate control, which allows or model to adaptively change the bitrate across space for each frame. For the same quality traditional codecs achieve up to 60% larger code. Videos account for about 75% of the internet traffic and enterprises are increasingly using videos for various informational purposes, including training of customers, partners and employees, marketing and internal communication. However, most viewers do not have the patience to watch these videos end-to-end and our video watching experience has not evolved much in over a decade. 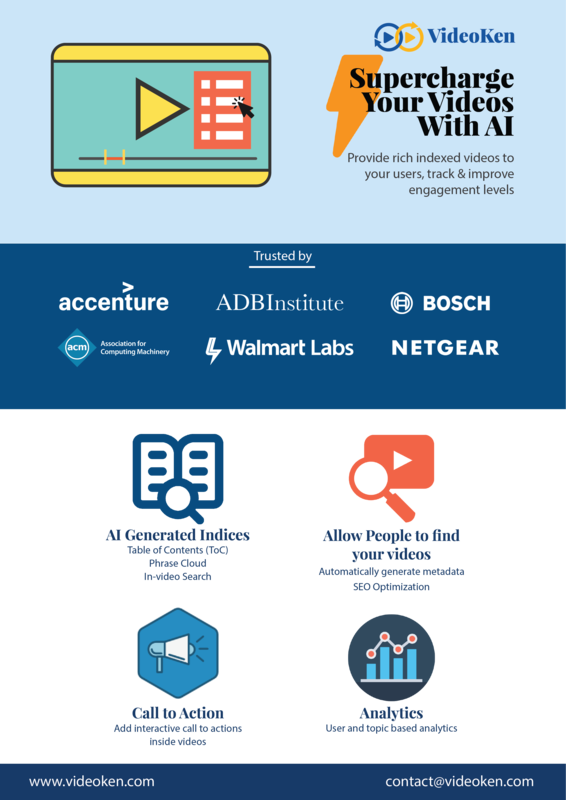 We present an AI-based approach to automatically index videos in the form of a table-of-contents, a phrase cloud and a searchable transcript, which helps summarize the key topics in a video and lets viewers navigate directly to the topics of interest. We use a combination of visual classification, object detection, automated speech recognition, text summarization, and domain classification, and show the results achieved on a range of informational videos. We conclude with some thoughts on the promise of transforming how informational videos are consumed as well as open problems and future directions. As practical applications of AI emerge in industrial robotics, we are starting to realize the potential of highly autonomous robotic systems not only capable of performing AI driven tasks in simulation or structured environments, but out in the field and even in extreme environments. However, there are optimum solutions that do not require the use of deep reinforcement learning or other Machine Learning methodologies. What is the right balance between powerful implementations of AI and traditional automation control to achieve a highly autonomous robotic system that can operate in remote unforgiving locations? Is there a right DNA for an AI powered robotic workforce for extreme environments? Summary, in this talk, Dr. Edgar Kalns who is the lead researcher on the SRI - Squirrel AI Joint Lab will discuss two exciting AI and Machine Learning applications for adaptive education. He will illustrate the theoretical foundation, technical approach, and research findings from the MILBA and VPA projects. In this talk we explore real world use case applications for automated “Fake News” evaluation using contemporary deep learning article vectorization and tagging. We begin with the use case and an evaluation of the appropriate context applications for various deep learning applications in fake news evaluation. Technical material will review several methodologies for article vectorization with classification pipelines, ranging from traditional to advanced deep architecture techniques. We close with a discussion on troubleshooting and performance optimization when consolidating and evaluating these various techniques on active data sets. Searching for homes is the primary mechanism guests use to find the place they want to book at Airbnb. The goal of search ranking is to find guests the best possible options while rewarding the most deserving hosts. Ranking at Airbnb is a quest to understand the needs of the guests and the quality of the hosts to strike the best match possible. Applying machine learning to this challenge is one of the biggest success stories at Airbnb. Much of the initial gains were driven by a gradient boosted decision tree model. The gains, however, plateaued over time. This talk discusses the work done in applying neural networks in an attempt to break out of that plateau. The talk focuses on the elements we found useful in applying neural networks to a real life product. To other teams embarking on similar journeys, we hope this account of our struggles and triumphs will provide some useful pointers. Bon voyage! Goal-oriented conversational systems are typically multi-turn, relying on the entire conversation thus far to generate a response to user input. Many of these systems use dialog state tracking or belief tracking, to either rank candidate responses from a pool of templates or generate responses directly while others are end-to-end. End-to-end models for goal-oriented conversational systems have become an increasingly active area of research. In this talk, I will present our recent efforts to build end-to-end conversational models for customer service application. We use historical chat transcripts and customer profile data to build models, and test with live customers using a human-in-the-loop research platform. We experiment with sequence-to-sequence model that generates responses word by word, and multi-encoder based ranking model to score template responses. I will compare these approaches as they apply to customer service domain.